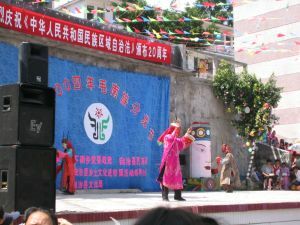 Most festivals are celebrated the same manner by the Maonan as the Zhuang and the Han Chinese, with the exception of a few which have Maonan characteristics. Among the festivals are the Chinese New Year, the Dragon Boat Festival, the Mid-Autumn Festival, the Double Nine Festival, to name only a few. 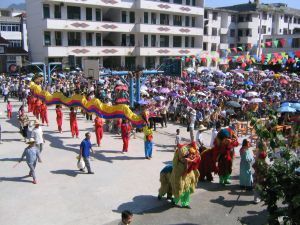 The most important festival for the Maonan is what is called theFenlongjie (Festival of Dividing the Dragons) in Chinese, ormiu in Maonan, literally '(festival of) the temple' . It falls on the first Day of the Dragon after the Summer Solstice (21 June in an ordinary year, 22 June in a leap year). According to a number of researchers, 'Dividing the Dragons' means to ask the local deity (Yu Huang Da Di) to 'divide' or allocate even numbers of dragons to the Maonan area, with the belief that the amount of rainfall will depend on the number of dragons: too many or too few can cause flood or drought. 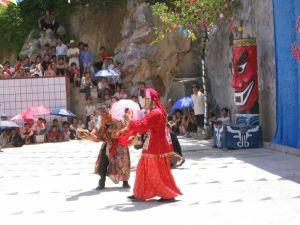 During the festival, there are many activities. The most important one is the ritual to offer sacrifice to the Temple of Gongsamgai ('Lord (of the) Three Kingdoms'), or Sanjiegong in Chinese, an immortal and a worship icon of the Maonan people. The immortal Gongsamgai is alleged to have brought production techniques and luck to the Maonan area. The Festival lasts for three days. The first day is presided over by the religious masters in the Temple of Gongsamgai where a series of religious ceremonies are carried out. An ox is sacrificed before the temple. The ox is killed with a big nail hammering into the ox's head on the second day of the festival. There used to be many religious performances in the courtyard and inside the temple. The activities are calledvaemiuin Maonan, literally 'do temple'. Activities of this kind have gone out of practice since the 1920s (Meng 1999: 23). I happened to be in huljok (the Sixth Market) to witness the miu there between 29 and 30 June, 2004. 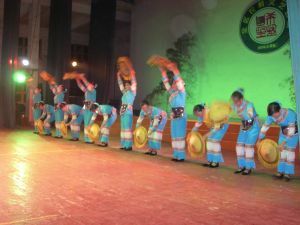 On 29 June, thousands of people flocked into the sports ground of Xianan High School to watch traditional performances by religious masters. There were also some performances by amateur actors from among local high school students (see picture, courtesy of Mr Qin Zikun). There was a bull contest among the performances. A dozen buffaloes were led onto the stage one by one. The members of the panel of judges scored the buffalos according to their fleshiness and overall confirmation. The prize winner received several dozen Chinese yuan prize money. On the last day, every family offered sacrifices to their ancestors at home.